We know people love lobster, but they can’t all get it where they live (that’s so sad! – if you are here, check out our map of lobster shacks), so today’s post is a guest post from our friends at LobsterAnywhere.com. Check their special offer for our readers at the end of the post! 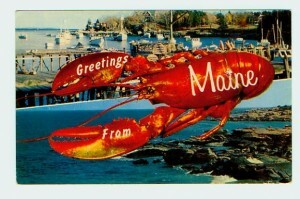 Looking for an authentic lobster bake, but can’t get to Maine? Try a lobster bake at home! You need an outdoor grill for this lobster recipe. A touch of seaweed really adds flavor to the taste of fresh seafood. 2. Place lobster, clams, mussels and shrimp on top of the seaweed. 3. Slice the lemon thin. Sprinkle the lemon slices over the lobster. 4. Cover with the rest of the seaweed. 5. Turn grill on low and close the cover. 6. Lobster bake should be done in about 12 – 18 minutes or when the clams and mussels are open. 7. Serve with the melted butter. Since 1999, lobsteranywhere.com has shipped the finest Live Maine lobster, lobster gifts, and chowders to satisfied customers coast-to-coast. Test the waters and give them a try. Enter BHBB at online checkout and get $10 off your first order.